Wheelstops | Perth Stocked, $40 fixings included! Wheel stops are an essential part of every carpark. Novaproducts Supply a tough recycled rubber compound wheel stop, which have marked out yellow strips to ensure that they are highly visible. Rubber Wheel Stops are a reliable and lightweight alternative to concrete. These rubber Wheelstops have a high luminescent contrast to Concrete parking areas for high visibility. A priority for every car park should be to ensure the safety of the visitors. Over 50 people in Western Australia trip over low visibility wheelstops every year. Help to reduce this number and accidents by using the brand new high visibility wheel stop “Safe Edge” from Novaproducts. 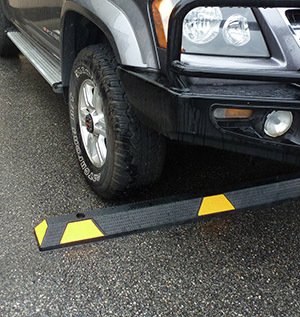 The “Safe Edge” is a great solution to protect individuals from tripping and at the same time making parking easier. Novaproducts prides itself on supplying Perth the best grade wheel stop. We avoid the hollow from end wheel stops as this allows vermin, spiders, snakes and other dangerous pests to hide and breed. For safety reasons we strongly promote them with high viz ( Visible ) yellow safety strips chevrons. When cars do not park exactly centrally at the wheel stop they can protrude out past car and cause a trip hazard. This is actually happening constantly and causing injuries. -Fixings supplied are deep penetrating to reduce dislodgement. -Simple to install. Only 3 fixings and no concrete is required. -The flat base of the wheel stop forms to the carparks surface. Rubber Wheel Stops shall be model No. SXT2761 supplied by Novaproducts Global having yellow chevron markings on black rubber molding and shall be fixed to the concrete floor using 3 x (screw type) screwed into 100mm long x 12 mm diameter masonry anchor or suitable chemical anchors. Black and yellow as standard. 12 months subject to a written warranty.